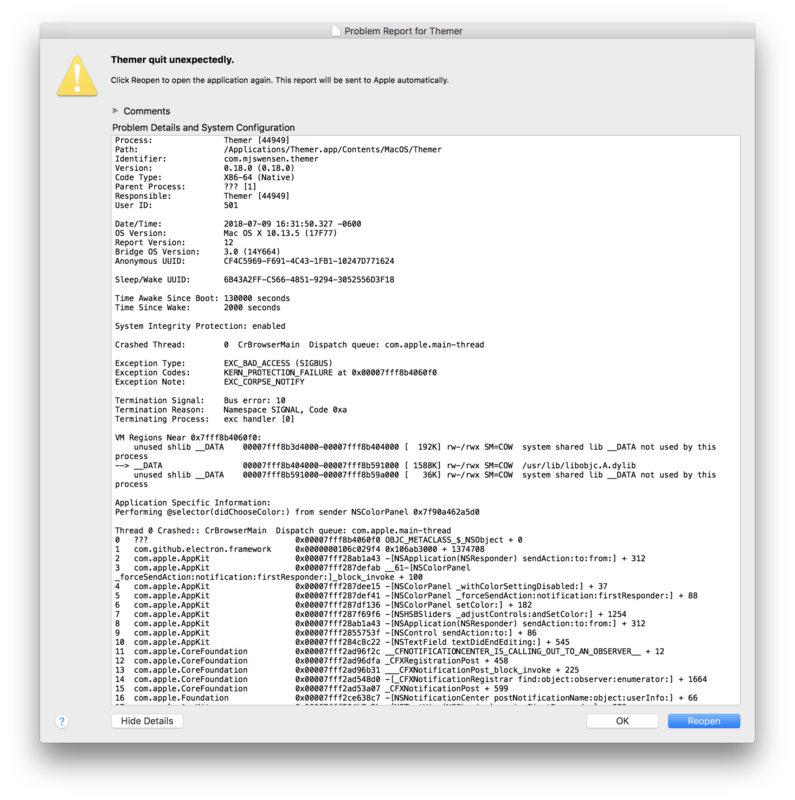 Electron application should not crash when a user closes the color picker in macOS. Occasionally (not every time) when the end user closes a native color picker (from <input type="color" />), the browser process crashes. The easiest way to reproduce is with the packaged application, which can be downloaded from the GitHub releases page. Hover over a label to reveal the droplet icon. Click the droplet icon to open the color picker. Use the eyedropper tool to select a color from elsewhere on the screen. Click the red dot to close the color picker. Hey @mjswensen. I worked on this issue with @caramelmagic, and we were unable to reproduce it, but we were using MacOS 10.13.6. Perhaps there was a fix in MacOS? 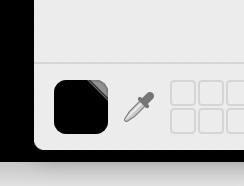 I'm going to close this, but if you're able to reproduce in the latest MacOS let's re-open and go from there. @groundwater , thank you so much for your time in looking at this issue! I think you may be right as I too am unable to reproduce after upgrading to 10.13.6. 🎉 If it crops up again I will report back. Thank you again. @groundwater, I hate to be the bearer of bad news but I just repro'ed the issue again, this time on electron@2.0.8 (still macOS 10.13.6), which I released as part of themer-gui v0.18.2. Here is a snippet of the stack from the crash report window. Happy to send along more if it's helpful. I have had this same issue with Electron 1.7.5 and continuing now through 2.0.8. 2a. Select RGB Sliders mode. 2c. Close and re-launch app. 2d. Open color picker from <input>, RGB Sliders mode should be active. Close color picker, this will crash the app. Note that this crash can be reproduced using any of the Slider modes. Another observation: if I ever select a color with the color wheel while using the app, I cannot get this crash to occur with any number of iterations of opening, adjusting, closing the color picker. @groundwater Can we reopen this issue? It's still a persistent bug. Close the app - the color picker stays open but the field that initiated the picker is no longer there of course. Reopen the app and try to use the picker. At that point the app crashes. If there were a way to force the picker to close when the app closes it would be easy but there's no way to do that. Is there a way to catch the error in the main process maybe? I am still experiencing this segmentation fault on Mojave version 10.14.2 using electron v4.0.2. Did anyone find a workaround ? At this point the app should crash. I managed to cook up a fix for this, going to post a PR with a patch and a PR to chromium to fix this tomorrow. @MarshallOfSound That crash was very similar (I think the root cause might be the same even), but this is a separate bug it looks like. Sorry for the delay, it took a long time to figure out the upstream fixes needed - and to get them merged. A PR is up now to address this.